Editor’s note: This post was originally published on 11/24/17 and has been updated for accuracy and comprehension. Instagram currently has 500 million active daily users and 800 million active monthly users. Engagement rates on Instagram are 15 times higher than Facebook and 20 times higher than Twitter. It’s pretty obvious that Instagram stories can greatly impact your social media marketing efforts if done properly. That’s why you have to make it part of your Instagram strategy. Here are the primary ways you can use Instagram to achieve all of the things I just listed above. What kinds of stories make sense for your business? How many posts per day will you do? What days will you create stories? Every industry is different, so it’s important that you plan. Zig Ziglar said it best..
Before you set out to tackle and dominate Instagram stories, you need a well-thought-out plan to ensure that you actually know what to do daily. What kinds of stories are you going to post? In the following steps, I’ll break down different kinds of Instagram stories. Writing down which kinds you intend on doing is really the first step. What’s your schedule? Is your audience active on weekends? What about weekdays? For Flight Media, our primary audience (business owners & other agencies) are active on Instagram the most from Monday-Friday. That’s why we only do stories during the workweek and then take a break on weekends. However, if you have a retail store, weekends and after-hours on weekdays will probably be your best times to create Instagram stories. Keep common themes in your stories. Just like on the show The Office, you anticipate Jim trying to prank Dwight in just about every episode. In fact, you look forward to it! The same applies to your Instagram stories. If there is a particular thing you do that clicks with your audience, then continue doing it regularly – even if it feels repetitive. Every Monday, during our team meeting, I get everybody waving to the camera while I take a Boomerang Instagram story. People love it and it gets a ton of engagement, so we do it weekly! What Instagram accounts inspire you with their stories? Find three to five Instagram accounts that do phenomenal stories and watch them regularly. You’ll find inspiration to keep doing them, as well as gain more story ideas! When it comes to creating stories, there are really two ways to do it. 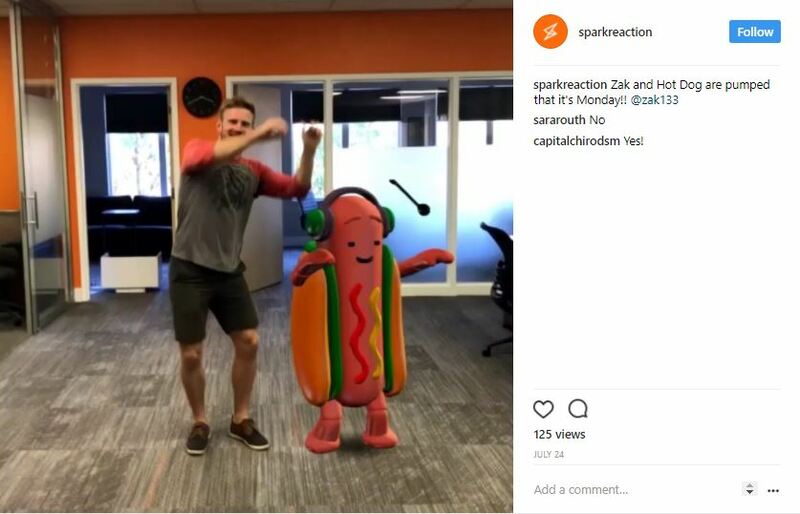 Both are important to your Instagram story strategy; however, if you’re looking to make EPIC stories, then you’ll need to sprinkle in templated stories throughout the week! On-the-fly templates are easy and take 30 seconds or less. Templated take a bit more effort, which is why most people drop off when it comes to doing them! Templated stories are typically created in a computer program like Photoshop, Adobe Premiere, iMovie, or Final Cut Pro, then sent to your phone for uploading. To create templates for these, you’ll need to use one of the tools I listed earlier with the dimensions of 1920 x 1080. Once you have a template, you’ll want to create a folder on your computer to save each exported story to. 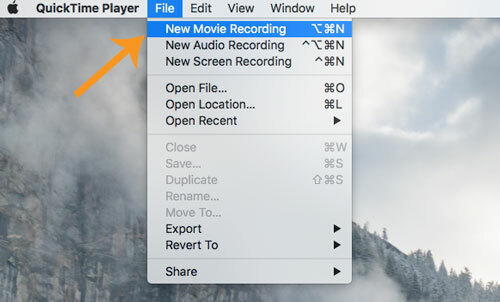 Whenever we release a new blog post, I use QuickTime Player on my Mac to record my phone screen. 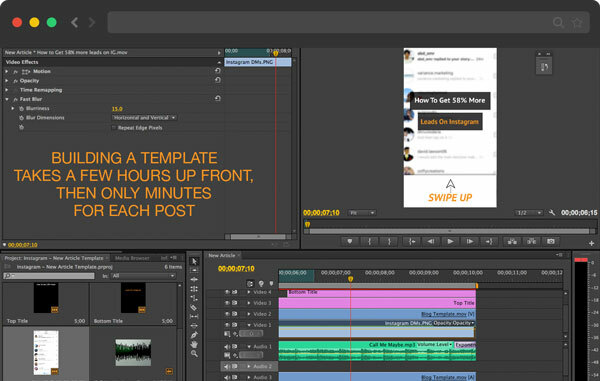 Once my phone screen is recorded, I import the video into Adobe Premiere, where we have our “New Blog Post” template. I simply add a new background song and insert the phone screen recording, then export the mp4 to my “New Blog Posts” folder. From there, I’ll email, text or airdrop the mp4 file to my phone for saving. After it’s saved to my phone, I’ll upload it to Instagram. 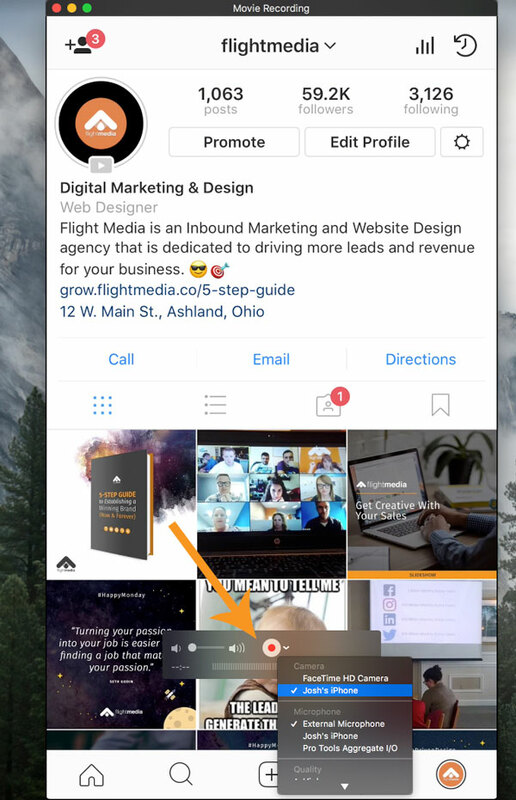 Once you have 10,000 Instagram followers, you’ll be able to access their “swipe up” feature, which allows you to insert a link for people to “swipe up” on their phones to instantly access. Now, if you do not have 10,000 followers, then you’ll want to direct people to click the “Link in Bio” instead. Either way, the goal is to get your Instagram story viewers to take action. Story templates will help you maintain a consistency with your postings, but also having good behind-the-scenes content will take it to the next level. Working on projects. Whenever you’re working on a project, it’s very valuable to document the process with your Instagram stories. Why? Because it is indirectly selling the viewer on your business. It’s showing them how you operate and what you’re capable of. 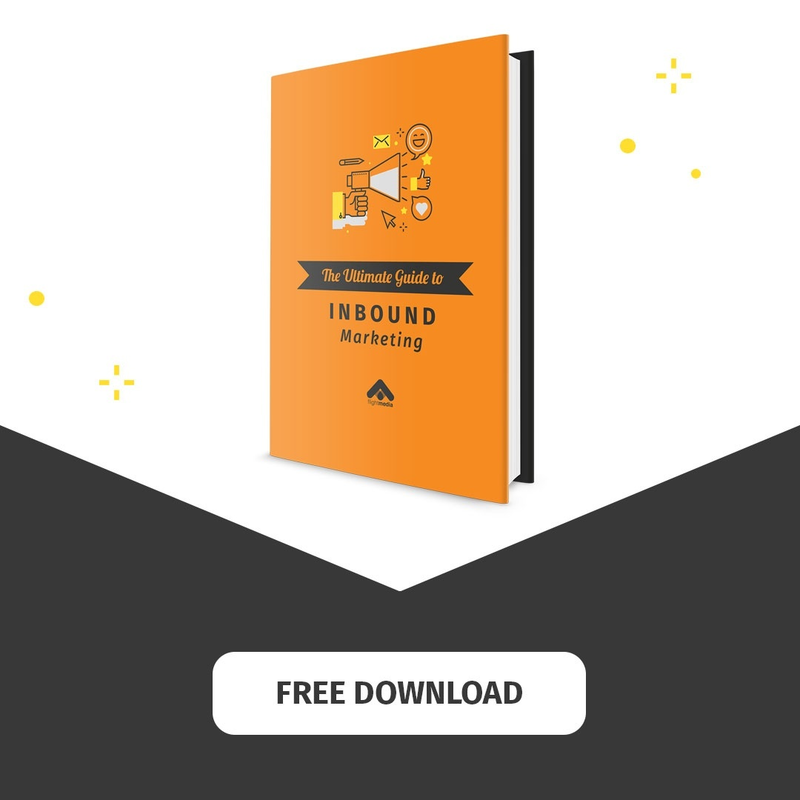 Using this simple strategy generates Flight Media tons of leads who have seen the level of service we provide our other clients! Team culture. If you’re treating your team to ice cream, story it. If you’re doing a team outing or even messing around (appropriately) in the office, story it. Prospects and clients love to see passionate professionals enjoying what they do. Because when they see how enthusiastic your people are, they’ll want to work with you even more. Spark Reaction does a great job of showing their culture. New products in development. One of the greatest ways to build anticipation and to create a new product’s “waiting list” is to show snippets of the product progress. Pat Flynn with SmartPassiveIncome crushes it mid-course during his product launch. Market research. If you want to grow your list, while also learning more about your audience and finding your ideal customers, then poll your Instagram followers with your stories. We recently started implementing this one and were instantly able to pull out 40-50 people who are the ideal customer for a new product we’re releasing. Now, we’ll have a list of people to market the product to on day one! But the most important thing is that it gets your audience incredibly engaged. This one doesn’t necessarily make your Instagram stories more EPIC, but it does increase your story exposure – which is epic, right? When you create a story and you’re in a certain location, make sure that you add the location by adding it to your story. By doing so, your story will automatically show up in that location’s city story. 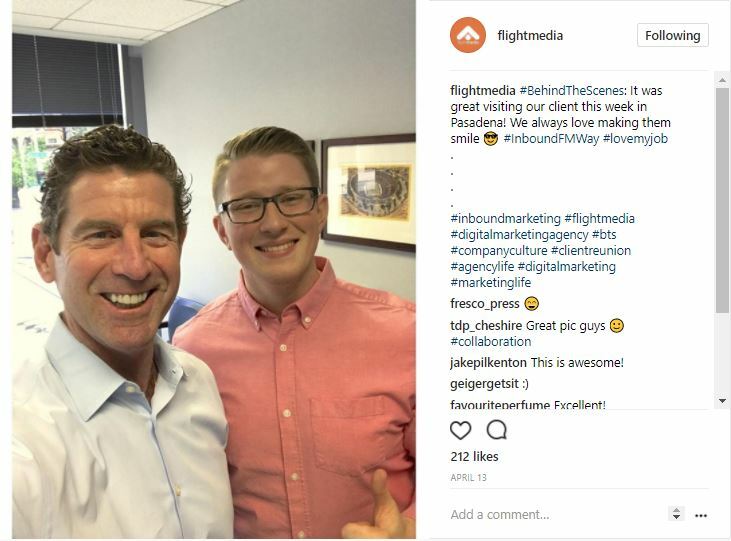 For example, whenever I’m at Flight Media’s main office in Ashland, Ohio, I make sure to tag Flight Media as the location (or any coffee shops I’m at) because it adds our story to the “Ashland Story”. If you’re in a bigger city, like Phoenix, your story will instantly add 50-300 more views to it in a matter of an hour because of the high number of viewers on the “Phoenix Story”. By following this strategy daily, you’ll not only get more organic views on your stories, but you’ll get new followers as well! Cha-ching. One last statistic to drive the point home – 80% of those 800 million users mentioned before follow at least one business account on Instagram. The bottom line is that you need to be taking advantage of this medium. These four ideas will take your Instagram story game to the next level. The challenge is following through. Flight Media has used every one of these tactics, so this entire post is from hard experience. If you commit to Instagram stories and leverage these ideas, you’ll undoubtedly see growth in followers, traffic, leads, and conversations. Have you tried incorporating Stories into your Instagram strategy?